Big games, long lines and $250 tickets: What did attendees of the first open-to-the-public E3 think? The Electronic Entertainment Expo kicked off yesterday, and for the first time in the show's 23-year history, members of the public were welcome. The organizing Entertainment Software Association made about 15,000 tickets available to anyone with $250 ($150 for a few early birds) and a desire to see the next wave of games from the gathered platform holders and publishers in attendance. The impact all those additional fans would have was apparent from before the show even opened, when people (many but not all of them wearing fan pass badges) formed immense lines to get into the exhibition halls, crowding the convention center to a far greater degree than in previous years. Eventually the lines grew so long that they opened the expo halls 15 minutes earlier than scheduled because the dense knot of people in the concourse was becoming a safety concern. Some veterans of the industry were predictably unenthused about how the open-to-the-public experiment was playing out. But we wanted to know how it was working with the target audience, the people who paid so much money and in some cases travelled very far indeed just to be at ground zero of the gaming industry hype cycle. To that end, we spent some time Tuesday afternoon asking a handful of them what they thought about their first time attending E3. 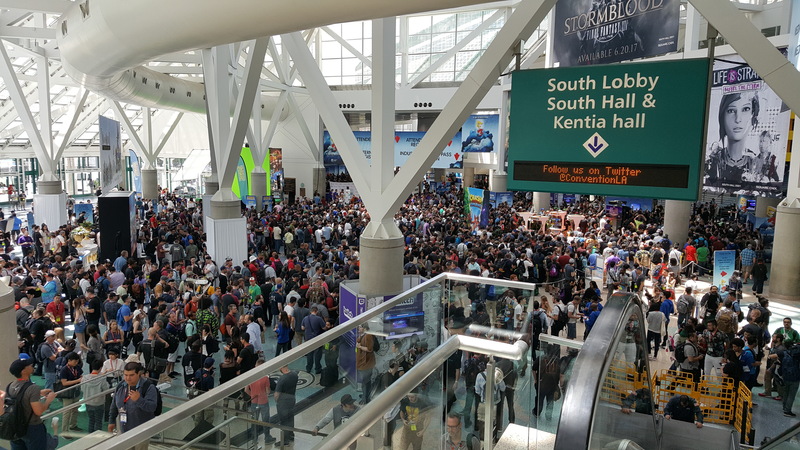 The scene in the LACC concourse about 30 minutes before E3 was scheduled to open. Brent Evans and his roommate made the journey from Houston, TX for the show, and he talked about it mostly in relation to his experience at fan-centric PAX events held around the US. While he readily gave the edge to E3 when it comes to the spectacle and production values of the booths, he was surprised at how much unused room there was around the expo halls. "I don't feel like there's as much to do as at some of the fan-based expos," Evans said. "With this badge, you see a lot more closed doors." The parts of the show that weren't behind closed doors were in front of long lines, so much so that when we spoke to Evans, he had yet to actually play a game. When asked if he was happy with his E3 experience so far, Evans declined to give a definitive answer. "It's definitely different," Evans said. "As far as the big three go - Sony, Xbox, Nintendo - it's real neat to see their blow-out booths and stuff everywhere for them, but there's such a big indie market now it's weird not to see a lot of that here as well... There's much more variety in the games you get to see with that. You're not just looking at a big ticket, AAA game that you've already heard and seen a lot about, that everyone's covering and talking about. Over the past couple years, that's how we've come across a lot of the games we play. It's like finding a gold nugget just digging through a lot of stuff." When we spoke with Olmo Aniceto-Chavez, he was behind Nintendo's booth, in line to try out Splatoon 2. The resident of nearby Northridge was sporting a Mario hat with eyes, a giveaway he'd received earlier in the day after taking care of his top priority for the show, going hands-on with Super Mario Odyssey. "The first thing I wanted to see was Mario Odyssey," he said. "This was my first E3 and that's what I was most excited about. It was pretty good, and I still had time to look at other things." He waited about an hour and a half to play the game, and said without hesitation that it was worth it. "I can tell you this. When people before me were playing, it felt much longer. But when I was playing, it felt much shorter," Aniceto-Chavez said. He'd also had a chance to try out Everybody's Golf in the Sony booth, which he also enjoyed. After Splatoon 2, the next game on his list to see was Marvel vs. Capcom Infinite. Overall, he said he was happy with his experience, saying it was "pretty good so far." Tanya Pautip travelled from Las Vegas for the show, and like Aniceto-Chavez, had a specific game in mind from the get-go. She skipped the initial crush of people pouring into the expo halls in order to attend an Inside Bungie E3 Coliseum panel, then promptly joined an hour-long line to play the game they'd been discussing: Destiny 2. "That took up most of my time, but I loved it," Pautip said. "I can't wait." Pautip said she's excited for just about everything at the show, as it seems like a particularly good year for games. Over the rest of the show, she's hoping to get her hands on the Switch. Of the people we spoke with, she was by far the most decisive when asked if she was happy with her first E3 experience. "Oh yeah, definitely," Pautip said. "I hope they keep opening it up to the public because I'd love to come back." Robert Hickman was on the other end of the spectrum. He'd made the trip down from Fresno for E3 because he used to watch the excitement of it play out on cable channel G4 years ago, and wanted to see it all in person. Unfortunately, much of the G4 coverage was built around press briefings either from companies that held their shows as separate events before E3 (Sony, Microsoft, Nintendo), or companies that used to hold such events at the show, but no longer do (Capcom, Square Enix). "It wasn't what I expected," Hickman said. "I thought I was coming here to see all that, so... But it's still nice. I just wish the lines weren't as long." He'd already played World Rally Championship 7 and was looking forward to trying Star Wars: Battlefront 2 and Gran Turismo Sport, but so far described his E3 experience as "just waiting in line, pretty much." "If I knew it was like this, I probably wouldn't have come," Hickman said. "Playing the game stuff is cool, but it's worse than going to an amusement park. There you'd wait like 30 minutes, but here it's like 2 hours." 25 years ago I could see the need to go to events like this, but now, with the internet I dont know why any "fan" would want to go there,and as far as industry types, other than to network I'm not sure what the point is either, and to be honest Im not even sure it worth trying to network there anymore, be better off at the GDC.